Artwork of Dumb Drum from Donkey Kong Country. Dumb Drum is the boss of the fifth world, Kremkroc Industries, Inc., in Donkey Kong Country. It is a robotic variant of an Oil Drum but with similar functionality to a Black Drum. 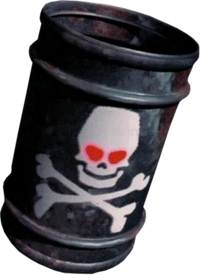 It has a skull and crossbones emblem on it, and is fought in its boss stage, Boss Dumb Drum. At the start of the battle, Dumb Drum will attempt to smash Donkey Kong, and his buddy Diddy, by floating in the air and slamming itself down on them. If Dumb Drum misses the Kongs, it will begin to release two enemies out of its body. It will release the following enemies; Kritters, Slippas, Klaptraps, Klumps, and Armies, in that exact order. If the Kongs defeat these enemies, Dumb Drum will attempt to crush them again at a faster pace after each round and tries to do so once more for every wave beaten (ex. : after the Kritters are beaten, it will do so twice, after the Slippas, three times, etc.). In order for the Kongs to defeat Dumb Drum, they must destroy all of the enemies it releases, which somehow affects it. In the Game Boy Advance port, the Kongs have to throw a TNT Barrel (which will appear after taking out the enemies) at Dumb Drum while it tries to crush them (though it does not speed up) to damage it. It only tries to crush the Kongs until they throw the barrel, and if they miss, it releases the enemies again. When defeated, Dumb Drum will self-destruct, giving Donkey Kong and Diddy Kong access to Chimp Caverns. In the SNES version of Donkey Kong Country, Dumb Drum will sometimes make different noises when it hits the ground. Unusually, in the SNES version, the enemies that Dumb Drum releases are all immune to Donkey Kong's Hand Slap attack. This page was last edited on September 2, 2018, at 04:18.